I’m writing this a few days ahead of time. It’s the third weekend in October, so you and I will be at the New York State Sheep and Wool Festival in Rhinebeck, New York, seeing lots of friendly faces: human, ovine, and whatever the scientific word for rabbits is. Hasidic Jews believe that if, just one time, every Jew kept the Sabbath, the Messiah would come. 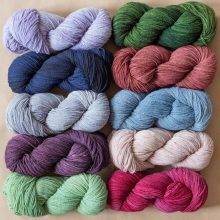 My version of that belief/hope is that if every knitter and lover of fiber could get to Rhinebeck, there would be peace on earth, and we would all stand on the hillside and sing, like that old Coke commercial or the Whos of Whoville. But everybody can’t be there; there’s too much in the way. There is consolation in this truth: Rhinebeck may be the big daddy of fall fiber festivals, but at its core it’s the same thing that all sheep and wool festivals are. I have never not enjoyed a fiber festival, no matter how small or new. So find out if there’s a festival within range of where you live, and go there. The sheep, alpacas, sheepdogs and angora rabbits will be glad to see you. The vendors of food, tools, fleeces and yarn will be really glad to see you and to have your support. And you’ll have a great day in the fresh air. Take a non-knitter. They will be amazed. They might get an inkling of what you like about the fiber world. We’ve shared the video up top before. 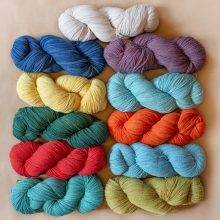 It’s a few minutes of romping through Rhinebeck, made in 2010 by Clara Parkes, author and editor of Knitter’s Review, and our beloved contributor. I sometimes google up this video just to give myself a moment of pastoral bliss. It’s centering to me, a meditation on the good in the world, which includes such wonders as chicken pot pie and sheep winning ribbons for being beautiful. 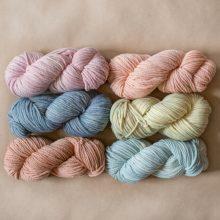 Wherever you are today, take a minute to hold some wool in your hands, and have a caramel apple if you can get one. Ponder the good in the world. We’ll be back on Monday. P.S. Need more sheep? Check out these Herdwicks coming down from the fells in England’s Lake District for lambing time. Fourteen minutes of zen. Or how about a Brilliant Sheep Herding Demonstration Using Border Collies? Featured Image: From a Rhinebeck no earlier than 2008 (based on our twin Belinda Wraps; the pattern was published in 2008). 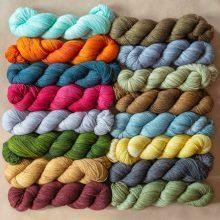 The MDK Shop brings the fiber festival to you. 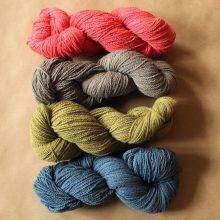 Artisanal yarns made by nice people. Dear Ann and Kay, it was pleasure to meet you in person again at Rhinebeck. 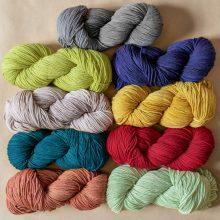 I read your blog every morning for a bit of inspiration in the vast knitting world. Thank you for signing the ‘Fair Isle’ booklet. I’m attempting to use that technique again after being taught by the infamous Alice Starmore in the ‘90s during her book tour to promote her first Fair Isle book in the States. Keep writing entertaining blogs and I’ll keep reading every morning. P.S. I really wanted to see the big flower jacket that Ann spoke about last week. I’ll be there today – so excited! Hope to see you in the book booth. I need to figure out which Field Guide to bring home with me! Is there a collection of fiber festivals on on the internet somewhere? I’m in MD, so we have the next most exciting sheep and wolf estival, and many more (alpaca festival in 2 weeks!) Just curious. I always love Gale’s video Strike A Pose that she took there. It makes me smile. Have fun and scrunch the woolly top of a sheep’s head for me! I have recommended the Vermont Sheep and Wool Festival in Tunbridge to many folks, and am going to take this opportunity to do it again 🙂 Rhinebeck is a phenomenal event, no doubt about it – the hands-down get-there-once-if-you-can festival of fiber. I’ve loved it every time I’ve managed to get there, and hope to do it again. But there is a lot to be said for a smaller-scale, family-friendly event, nestled between the wooded hills of southern Vermont, which are usually at some stage of coloring up by the end of September. There are sheep of many breeds, workshops and demonstrations, sheepdogs, cashmere goats, vendors, food…in short, All The Stuff. I’ve come home with jars of honey, handwoven towels, packets of seeds, a FAMACHA certificate, and – of course – needles, notions, and yarn. I will probably never get to Rhinebeck but I went to the Black Sheep Gathering in Oregon this year and it was awesome. You should come! Sear Ann and Kaye, it was such a pleasure to meet you on Saturday! You make my morning commute on the LIRR si much better. Thank you for signing the Field Guides, I can’t wait to start a Log Cabin blanket. See you next year at Rhinebeck! And your smiles lift me up ! Rabbits (like hares and pika) are lagomorphs (NOT rodents!). One day I shall return to Rhinebeck but in the meantime I’ll enjoy everyone’s IG posts and stories and visit the llamas and alpacas down the road and the fiber festivals at Estes Park and Taos which are a bit closer to home.